We are always looking at new ways to be more efficient and recently our attention was focussed on folding. Spring saw an extensive period of research and testing with numerous demonstrations and site visits. After careful evaluation of the market it was the Heidelberg Stahlfolder KH82 folder impressed us most with its high quality, high level of automation, and excellent flexibility. 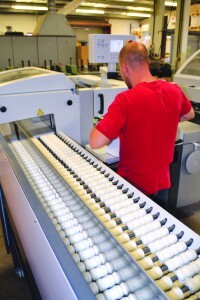 Installed in August the new machine is highly automated greatly improving setup times. Settings for regular jobs can also be stored in the memory for recall at a later date making the ongoing setup of regular publications much quicker. Traditionally it has always been time consuming to change the setup on a folder for different binding methods, the new machines ability interchange slitter shafts means that spare shafts can now be left setup for different types of binding and then quickly switched as production requirements dictate. The machine also benefits from a two tier stacking system which allows the operator to cope with the much higher running speed. The new machine will replace one of our existing MBO B30 folders and will sit alongside another B30 and a Horizon AFC-564. The new investment puts us at the cutting edge of folding technology for many years to come.